I had a very important date last night…several of them, really. And I thought that maybe I should tell you about it, because, well, really, we talk about most things, don’t we? Last night I took my four boys Christmas shopping. They each had to shop for one of their brothers. I didn’t limit their spending, I didn’t limit their choices, and it was worth every minute and every dime. Nothing beats a great hometown store…nothing. I’ve been shopping here for more than 30 years. I went to take Scooter to basketball practice, only to realize that practice was an hour later than I was expecting. 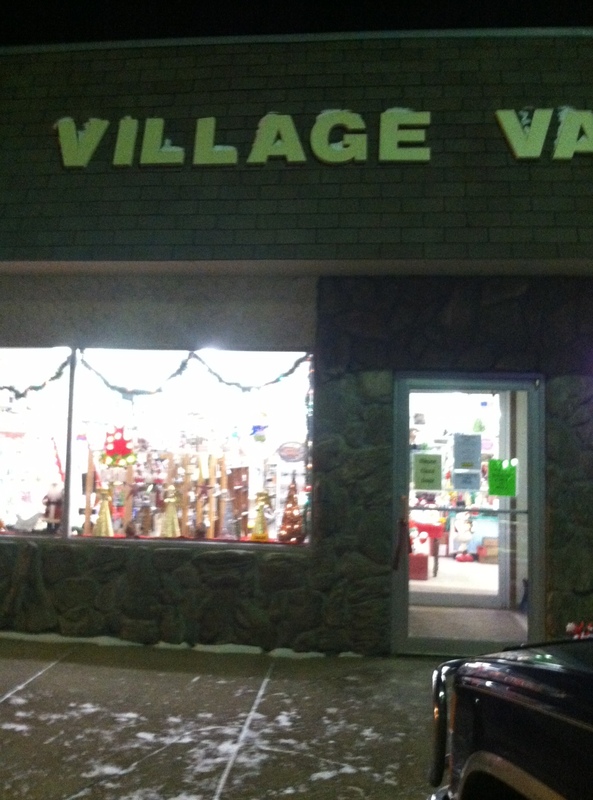 No problem, we’ll get some Christmas shopping out of the way at Village Variety. Scooter’s job was to pick one brother, and to buy a gift. He picked Big Bro, found something that “he would love.” We paid for it, had it wrapped and were on our way. I dropped Scooter off at my Mom’s, and picked up EJ. He picked George. We found a gift, had it wrapped and were on our way. George met me at the door, ready to go. 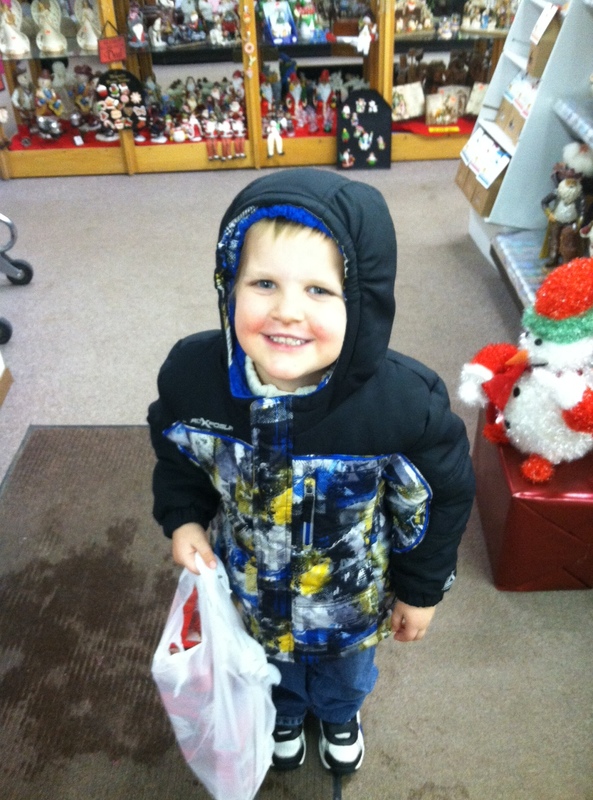 He knew he was going to go shopping for a gift, and he wanted to buy one for EJ. He already knew what to get him, so we picked it up, had it wrapped (found a little extra something for Grandma), and were on our way. A happy boy, with his gift for his brother all wrapped and ready for the tree! Last, but certainly not least, was Big Bro. He knew that the only brother left was Scooter to buy for, but he also knew what Scooter would want. We picked it up, had it wrapped and were on our way. Voila. Shopping complete. Big Bro had to carefully determine what Scooter would want. No rushing a well-thought-out gift! And it was the best trip EVER! It truly doesn’t matter what you buy, it’s why you buy it. And if it DOES matter what you buy, you shouldn’t have bought it in the first place. Love isn’t shown with the amount spent, it’s shown with the meaning behind it. A friendly face, a word or two of encouragement to my children and knowing that I’m supporting a local family goes a long way. I am most certain that my boys will follow in my footsteps and will enjoy the giving just as much, if not more than, the receiving. And in that aspect, I feel as if I’ve succeeded as a parent. Yay! 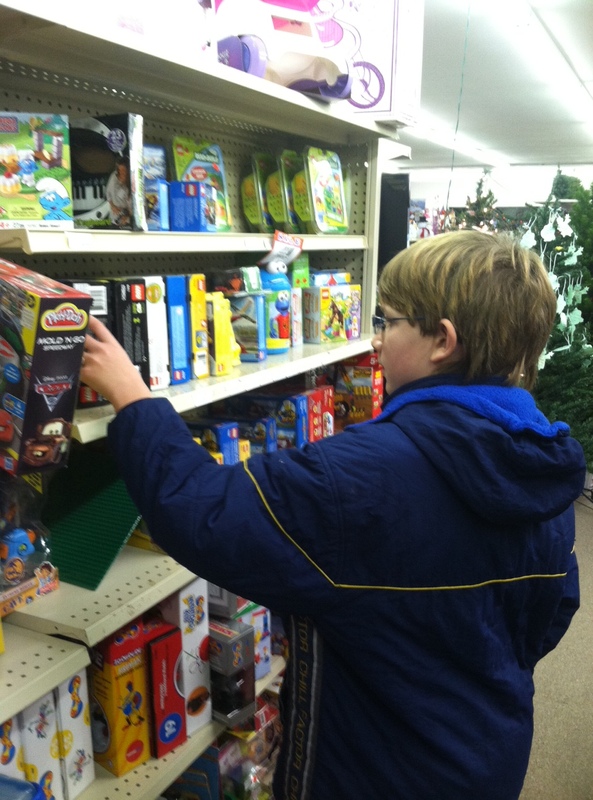 This entry was posted in Boys, Winter and tagged Christmas, holiday shopping, meaning of the season by wagfarms. Bookmark the permalink. Awww! I love reading things like this around the holidays. Eagerness to give, joy, thoughtfulness, family and love. Love how excited George is! Tell him I send him a very merry Christmas wish! Facetime ya soon!